Lt. Col. Scott, former 432nd Operations Support Squadron commander, accepts the inaugural Jimmy Doolittle Educational Fellow for Outstanding Support to Armed UAVs March 2 at the Martin H. Harris Chapter of the Air Force Association Air Force Gala banquet in Orlando, Florida. 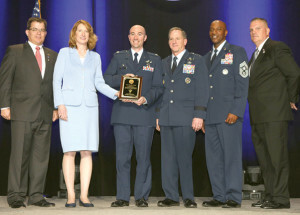 Acting Secretary of the Air Force, Lisa Disbrow, presented the award alongside, from left, Air Force Gala Chairman Michael Liquori, Chief of Staff of the Air Force Gen. David Goldfein, Chief Master Sgt. of the Air Force Kaleth Wright and Martin H. Harris Chapter President Gary Lehmann. CREECH AIR FORCE BASE, Nev. — The 432nd Operations Support Squadron earned the inaugural Jimmy Doolittle Educational Fellow for Outstanding Support to Armed UAVs March 2, 2017, at the Martin H. Harris Chapter of the Air Force Association Air Force Gala banquet in Orlando, Florida. Lt. Col. Scott, former 432nd OSS commander, accepted the award from acting Secretary of the Air Force Lisa Disbrow, alongside Air Force Gala Chairman Michael Liqouri, Chief of Staff of the Air Force Gen. David Goldfein, Chief Master Sgt. of the Air Force Kaleth Wright and Martin H. Harris Chapter President Gary Lehmann. The 432nd OSS was recognized for their continued support to MQ-1B Predator and MQ-9 Reaper remotely piloted aircraft. “The OSS mission is diverse and complex which drives a decentralized approach to operations,” said Lt. Col. John, 432nd OSS commander. In addition, the OSS manages all operations for the Creech airfield, which is one of Air Combat Command’s most active flight lines. 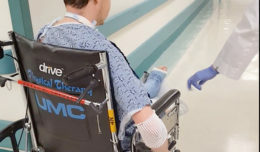 They also process aviation records and develop training programs which affect the entire MQ-1 and MQ-9 enterprise, while supporting intelligence and weather requirements for 3 million square miles of area of responsibilities to provide command and control for all MQ-1 and MQ-9 combat lines. “The only way one squadron can successfully carry out such an array of complicated tasks is by ensuring our people are trained to be the best at what they do and then trusting them to perform at their very best each and every day,” John said. This relentless dedication to duty led to winning the first award of its kind, which was a prestigious event for the squadron. 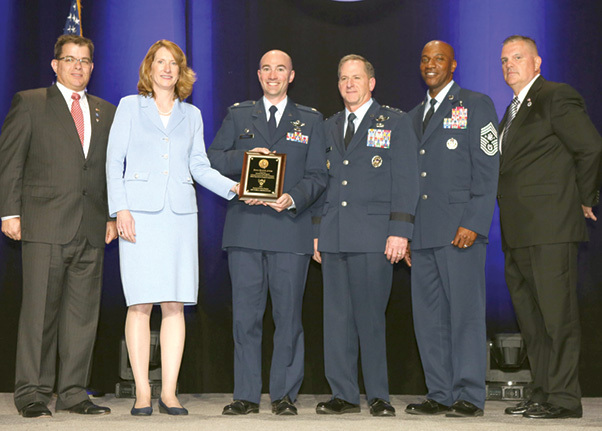 The 432nd Operations Support Squadron earned the inaugural Jimmy Doolittle Educational Fellow for Outstanding Support to Armed UAVs March 2 at the Martin H. Harris Chapter of the Air Force Association Air Force Gala banquet in Orlando, Florida. The 432nd OSS was recognized for their continued support to MQ-1B Predator and MQ-9 Reaper remotely piloted aircraft by providing all aspects of MQ-1B and MQ-9 RPA global operations support including: airfield management, weather support, aircrew training, intelligence analysis, intelligence initial qualification course instruction, weapons, tactics, exercises, and combat command and control. 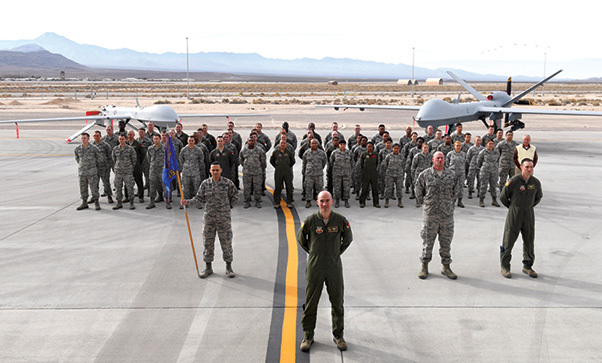 It’s the professionalism of every Airman within the OSS that helped win the award, and ultimately continues to make the overall MQ-1 and MQ-9 mission possible.